Symposium Technologies is proud to announce the introduction and deployment of the EME Mobile –a fully integrated mobile solution that puts all the information sharing capabilities of the Horizon EME CAD into the hands of responding personnel. 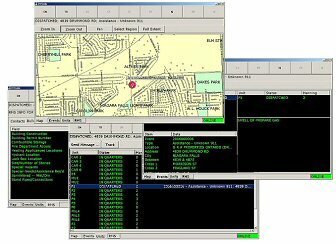 The system – while fully customizable to meet the needs of any client – incorporates a number of features and capabilities that are of specific use to Fire and EMS agencies – services traditionally less well-served by mobile data than police. The system has undergone extensive field-testing, and is now deployed operationally with COMM Fire and EMS District of Massachusetts. The EME Mobile incorporates a map-based interface that enables responding personnel to see both the address and location of the incident as well as other nearby features that might be important, such as open and closed hydrants, locations of interest, road closures, and active burn permits, among others. Responding personnel can update their status and record benchmarks in real time using a quick and easy touch-screen interface, thereby notifying dispatchers as to the changing situation and recording important response and incident times in the CAD’s audit trail. Another powerful feature of the EME Mobile is its ability to query the client’s RMS system directly in much the same way as the Horizon EME CAD, providing access to important premise information such as premise contacts, HAZMAT, and building diagrams. Another powerful feature is GPS-based AVL, which enables in-field personnel to track the position of other responding vehicles in real time while also providing them with a snapshot of their own location – something that can be very valuable if they are responding in an unfamiliar area or need to know who’s first on scene. The EME Mobile retains all the flexibility of the Horizon EME CAD, enabling clients to fully customize the system to reflect their specific needs, requirements, workflows, and operating procedures, resulting in a solution that fits the unique needs of each department. The system also works with a diverse range of GPS gateways and wireless networks, providing clients with the widest variety of options for implementation.